More and more frequently, insulation contractors are being asked to include firestopping in their scope of work. Many others are actively bidding firestopping; still more have a desire to bid, but feel they don’t have an adequate knowledge or comfort level with regard to firestopping. While insulation professionals may be familiar with the thermal properties of various pipe insulations, many are unfamiliar with how these products behave in a fire. Here’s a glimpse into the fire-resistance and burning characteristics of commonly used pipe insulations and how they should be properly firestopped. Fiberglass or glass fiber pipe insulation is an extremely common pipe insulation material. It can range in thickness from a 1⁄2-inch up to 4 inches. On most commercial projects, thickness normally does not exceed 2 inches. The density of fiberglass is approximately 3.5 pounds per cubic foot. When firestopping fiberglass pipe insulation, it is recommended that the seams be tightly butted when the insulation is installed. Any gaps or voids are areas where airflow can occur. Oxygen is necessary for combustion, and wide gaps or voids where air can flow unchecked can affect the performance of a firestop system. Floor penetration applications with up to 2-inch-thick fiberglass feature Underwriters Laboratories (UL) systems with intumescent (expanding) caulk over mineral wool. Intumescent materials are required as the lower melt point of the fiberglass will create a void or gap as it burns away. In most cases it is possible to use a 1⁄2-inch thickness of sealant over a 3- or 4-inch depth of mineral wool packing material. The mineral wool must be tightly packed to compress the insulation against the pipe. For applications exceeding a 2-inch insulation thickness, most manufacturers recommend an intumescent wrap strip tuck-in. In some cases, an external collar might be utilized. Conversely, for thinner insulation, such as 1⁄2-inch, there are systems that use less sealant, or even caulk-only, with no mineral wool. 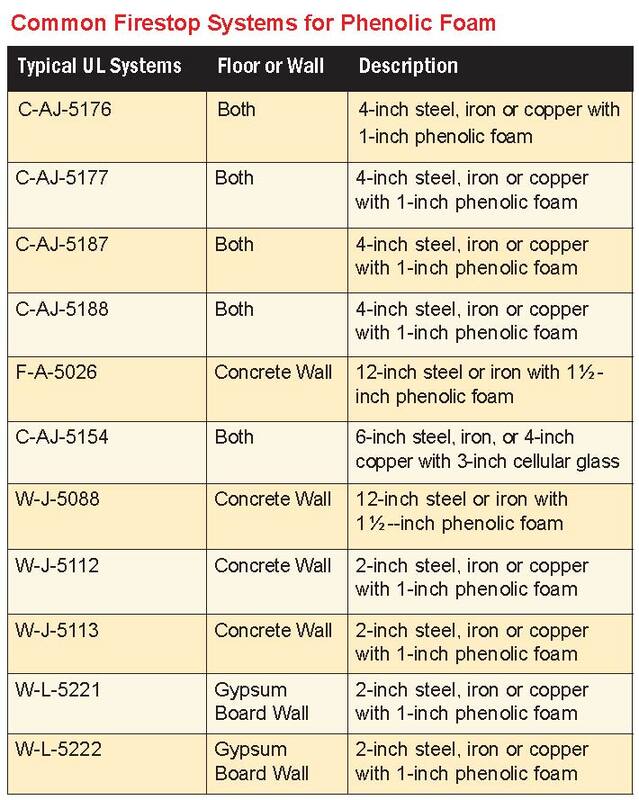 Walls are much less critical than floors; so most systems for up to 2-inch-thick fiberglass will be caulk only. A 5⁄8-inch depth of firestop sealant is all that is required to protect most applications. When the insulation thickness exceeds 2 inches, a wrap strip tuck-in is the preferred method. A common challenge or concern arises when the pipe is not centered in the hole. Most UL systems in wall applications allow for a single-point contact, where the insulated pipe or tube contacts the periphery of the opening. A few manufacturers have a system in walls (concrete and gypsum) for continuous-point contact, where a bead of sealant is applied around the perimeter of the insulated pipe at its egress from each side of the wall. It is recommended that an intumescent sealant be used around fiberglass. Most people have the misconception that the intumescent expands and squeezes off the insulation. In reality it compresses the insulation against the pipe, increasing the density of the pipe insulation, making it much more difficult for the fire to burn through it. In recent years, some UL systems were generated using nonintumescent (nonexpanding) sealants. Insulated pipes or tubes pose a special hazard when it comes to fire resistance. This hazard is somewhat trivialized by systems featuring nonintumescent products. Thickness and density of most pipe insulation is nominal. A test conducted on 1-inch-thick fiberglass insulation may actually be 7⁄8-inch to 11⁄4 inches in thickness, with the 7⁄8-inch material being the same weight as the thicker material. The product with the greater density would more than likely perform better under fire-test conditions. Since the ranges aren’t tested, the performance of a nonintumescent material might be altered due to variations in thickness and density. Intumescent materials are not appreciably more expensive than nonintumescent products, and the installer, inspector or owner can more reliably predict performance. Annular space (space between the pipe insulation and the periphery of the opening) is critical with fiberglass insulation. Too much or too little can be a real problem. In floor applications it is important to be aware of the point of contact between the pipe insulation and the periphery of the opening. Wherever possible, pack mineral wool to compress the insulation and keep it from contacting the periphery of the opening. Lastly, follow the parameters of the system when installing penetrants with insulation. Acrylonitrile butadiene/polyvinyl chloride (AB/PVC) flexible foam insulation is black foam insulation commonly referred to as "rubber." The most common applications are refrigerant lines or chilled water lines. The most common thickness range is 1⁄2-inch, 3⁄4-inch and 1-inch, with 1⁄2-inch to 3⁄4-inch being the most common. AB/PVC is an efficient insulator usually found on copper tubing. A common application is insulation on air conditioning line sets. It is not as easy to compress as fiberglass. Firestop applications for AB/PVC-insulated penetrants are very sensitive to annular space, although systems have been published with up to 4 inches of annular space between insulated pipes or insulated pipes and the periphery of the opening. 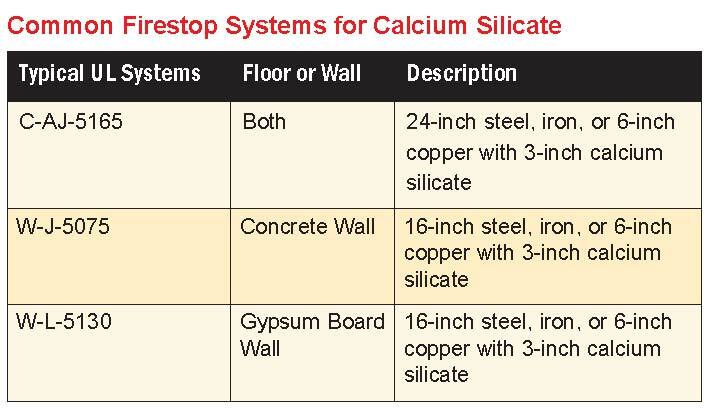 Typical firestop systems for floors include intumescent caulk and mineral wool packing. Most systems show a 1⁄2-inch to 1-inch depth of caulk atop mineral wool. Note that systems for 1-inch-thick AB/PVC may require additional sealant or even wrap strips. In the less critical wall applications, a 5⁄8-inch depth of firestop caulk on each side of the wall can be used. Like fiberglass, mineral wool is another manmade vitreous fiber product but with higher temperature ratings and greater fire resistance. 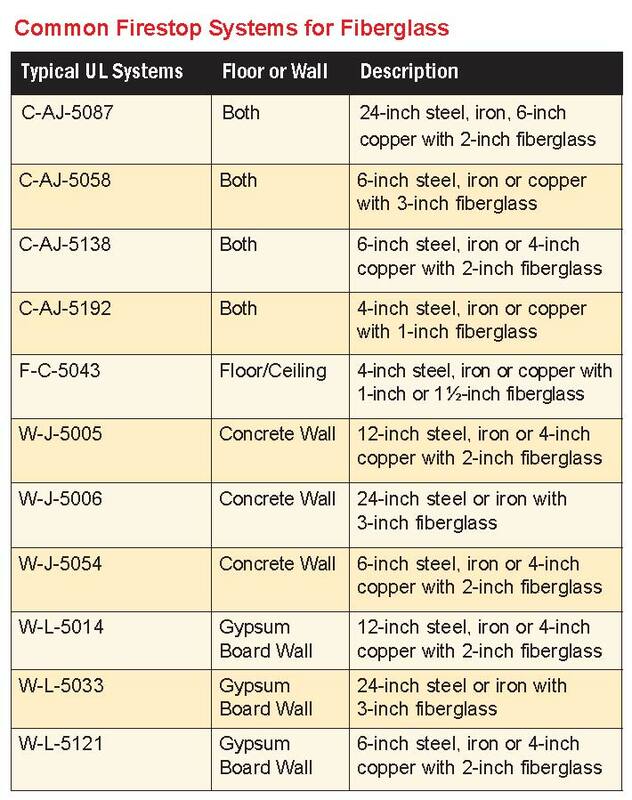 It can be used in many of the same applications as fiberglass. Most mineral fiber pipe insulation is used in industrial applications where higher temperature ratings are required. Mineral fiber pipe insulation is usually secured around a pipe with steel tie wire and is covered with various metal or industrial cloth jacketing. When it comes to UL systems, any system tested for fiberglass automatically is approved for use with mineral fiber, but not vice-versa. Fiberglass is more critical because it has a lower melt point than mineral fiber. Mineral fiber may be a good choice in applications in which a greater thickness of insulation is required or when a higher hourly rating is necessary. It does not burn readily; so most systems will be caulk and mineral wool packing or simply caulk only. Mineral wool is one of the least critical types of pipe insulation to seal. 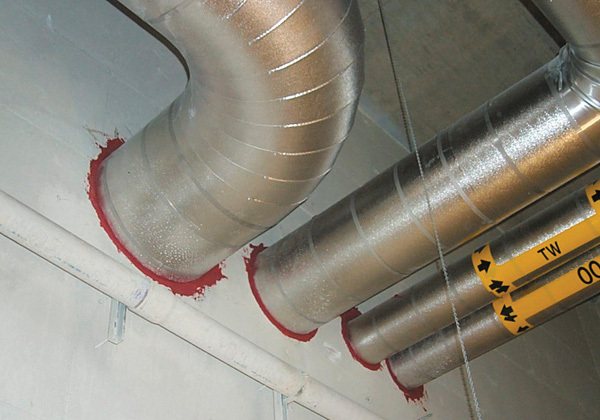 Calcium silicate pipe insulation, or "cal-sil," is quite flame-resistant. Like mineral wool it is most commonly found in industrial applications or commercial applications requiring a higher temperature rating such as auxiliary generator exhaust applications. It does not burn readily and therefore may also be used to protect conduits carrying sensitive wires or cables such as fire alarm cables or control cables for other life-safety devices. Most applications are typically covered with a metal jacketing. 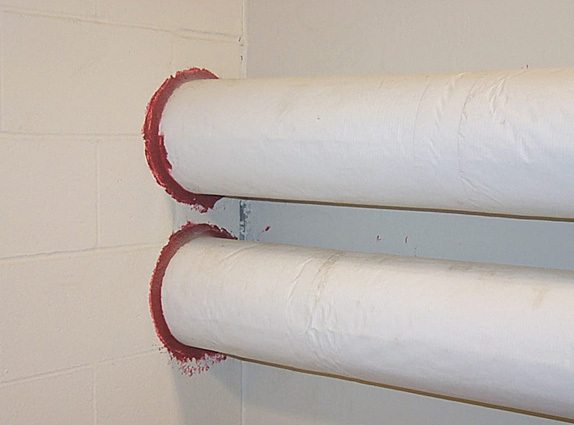 Calcium silicate pipe insulation can be caulked. In floors, packing material will serve to help facilitate installation of the sealant. Calcium silicate is recommended in applications in which a higher hourly rating is necessary. Asbestos, once considered a miracle product, is no longer being installed in new buildings because of asbestos-related health issues. In some older buildings asbestos has been encapsulated and is being managed in place. It can be sealed because it won’t burn, but it presents challenges. Most firestop manufacturers shy away from it for fear of litigation. These decisions must be made at the project level with the owners and architect. Cellular glass pipe insulation is a rigid closed-cell insulation comprised of minute, sealed glass cells that are formed through the chemical reaction of finely ground oxidized glass with carbon at high temperatures. Common applications are piping in extreme humidity areas (Florida, Gulf of Mexico), industrial processes and in low-temperature or cryogenic applications. Depending on the application, jacketing such as metal or coated fabric is typically required. 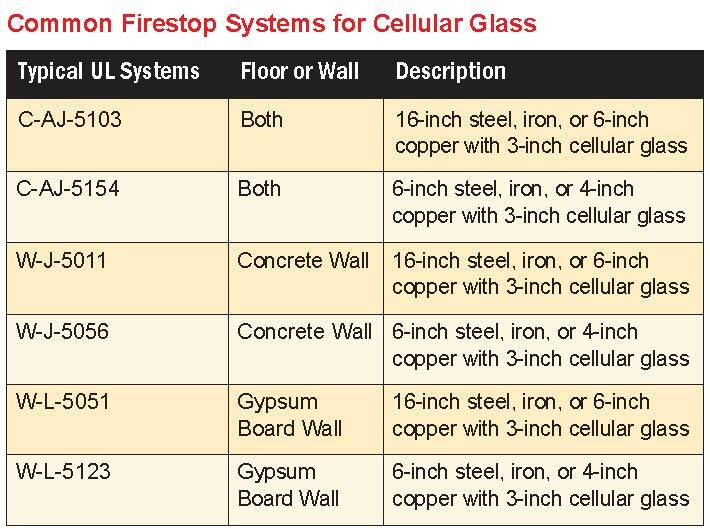 Firestop systems for cellular glass require an aluminum or steel jacket to be installed around the insulation for a distance of 12 inches on the top side of the floor or both sides of a wall. This is required because the insulation can crack when heated. It can also crack when the assembly is removed from the fire source and exposed to the impact, erosion and cooling effects of the UL water hose stream test. The metal jacketing allows it to pass a hose stream test by keeping the insulation intact and preventing a through-projection of water beyond the unexposed side of the assembly, as required as part of the conditions of compliance in tests to ASTM E814 or ANSI/UL 1479. Cellular glass insulation melts where exposed to fire, but when properly sealed using a listed firestop system, it is not a difficult material to protect. The easiest sealing methods are firestop systems using mineral wool and caulk in floors, or caulk only in wall applications. Many UL systems have been approved with this type of insulation. Polyisocyanurate insulation is another nonfibrous, closed-cell product. It is a lightweight cellular plastic that offers very low thermal conductivity and is commonly found in low-temperature applications, or in high-humidity areas. Currently, there aren’t any published firestop systems in the UL Fire Resistance Directory for polyisocyanurate insulation. Accordingly, where such penetrations pass through a fire-resistance rated barrier, it may be prudent to switch to a different insulating material capable of meeting the fire-resistance requirements for several feet on either side of the assembly. Metal pipes will conduct heat to the unexposed side of the assembly. This is especially true for copper penetrants. While you could design a mechanism to prevent the fire from passing through the opening in the barrier, auto-ignition of the insulating material on the unexposed side from heat conducted through the pipe is a distinct possibility. A safety margin of several feet should allow heat to be dissipated and prevent the likelihood of auto-ignition. Consult with the individual firestop manufacturer’s qualified technical personnel for more information. Phenolic foam is yet another nonfibrous, closed-cell product, with very good thermal performance. 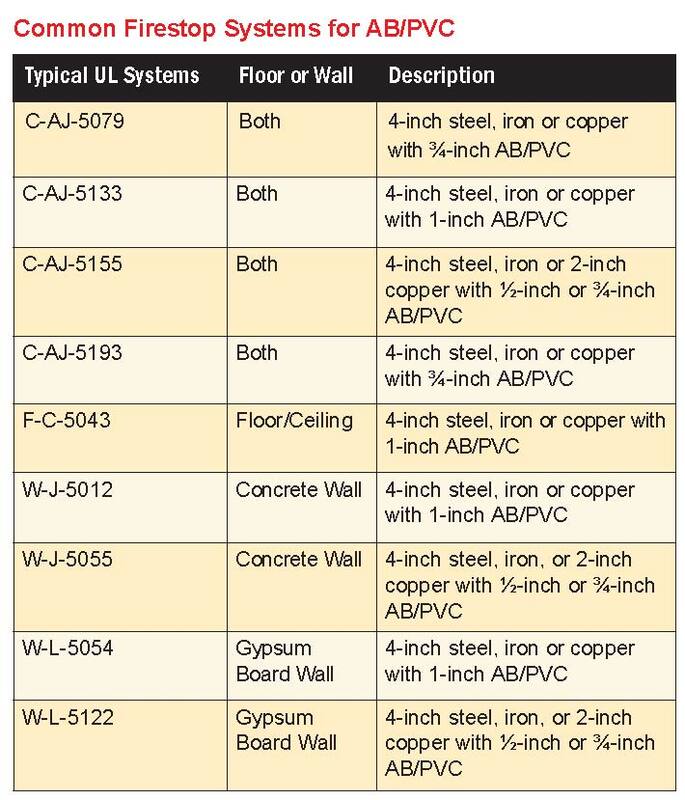 While phenolic foams are not as inherently fire-resistant as some pipe insulations, UL systems for floors and walls are available. 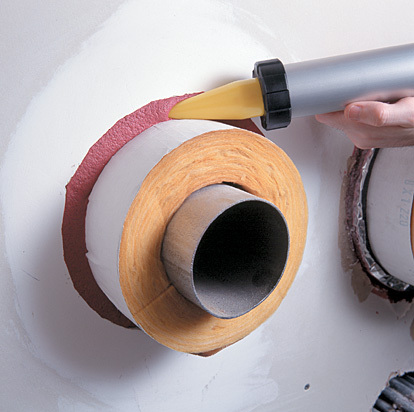 Caulk-only systems are available for 2-inch pipe with 1-inch-thick insulation in gypsum or concrete walls. Floors, again, are more challenging and require a combination of mineral wool packing and caulk for pipes up to 4 inches. Larger pipes and increased insulation thickness pose additional challenges and may require a combination of packing material, sealant, wrap strips and collar. Consult the UL Fire Resistance Directory for detailed information. In addition to fire-resistance considerations, the firestopping industry was recently informed by UL that a new protocol was developed to test the water resistance of the sealing material to restrict the passage of water from floor to floor. This rating is referred to as the W rating (See related article). A Class 1 W rating is assigned to firestop systems that can withstand the passage of water under a 3-foot pressure head for 72 hours. The test is predicated upon the sealing material being fully dried or cured. When it comes to insulated through-penetrations, there are other considerations that should be taken into account in terms of achieving a W rating. Nonfibrous, closed-cell materials are generally fairly water-resistant. On the other hand, fibrous insulating materials can be a problem as the water exposure can damage the kraft paper jacket. Such penetrations can easily be remedied by protecting the fibrous insulation with a 20- to 30-mil PVC jacket. The jacket should project downward into the opening in such a way that the sealant is applied to bond to the periphery of the opening and the PVC-jacketed insulation and extend 36 to 40 inches above the top of the floor. Seams in the PVC jacket shall be solvent-welded according to the manufacturer’s instructions. Always verify the existence of a UL classified firestop system for an insulated pipe or tube with an additional PVC jacket. Currently, only two manufacturers have tested this configuration at UL. Firestopping insulated pipes is fairly simple when the applications are considered up front. Choosing the right products and systems before the holes are core-drilled or sleeves are sized eliminates costly corrections later on. For example, if a particular insulation was chosen because of its unique insulating properties but that insulation cannot be properly firestopped above a certain thickness, provisions should be made to use a different type of insulating material that can achieve similar insulating characteristics. Alternative insulation types may require a greater thickness, which require a bigger hole in the barrier. Making this decision up front saves time and money in the long term. Similarly, choosing the right product in the beginning may prevent the product from being misused in non-tested applications. As previously stated, intumescent products tend to be more rigorously tested and thus more forgiving in terms of the scope of their correct use. A nonintumescent material might save pennies on a project, but the potential for misuse may outweigh any small savings. An incorrect installation of a nonintumescent sealant that requires remediation will quickly wipe out any savings garnered to date. Most reputable firestopping manufacturers offer training in the proper selection and use of firestopping products and systems. Additionally, manufacturers’ technical service engineers can help locate appropriate UL system designs and troubleshoot unique job-site configurations. By bringing the supplier into the loop earlier in the design stage, you can possibly prevent mistakes during the construction phase and thus make the job quicker, easier and hopefully more profitable. How to use firestop sealant around an insulated pipe. Firestopped insulation with metal jacketing. Firestopped pipe insulation with all-service jacketing.